Cut squash, zucchini and eggplant lengthwise in halves. Scoop flesh from all three and set aside. Chop 1 onion, 2 cloves of garlic, carrot, zucchini flesh, eggplant flesh, squash flesh and celery (including leaves). Sauté in a small skillet, with olive–oil, for 5 minutes. Meanwhile remove crusts from loaf and cut the slices into small cubes. Add vegetable sautéed vegetable mix to the cubes and combine this stuffing mix well. Mix 200ml of vegetable stock, 4 tablespoons olive oil and 6 tablespoons honey. Add 50 ml from this mixture to the stuffing mix. Put stuffing mixture in the oven for approximately 30 minutes – until bread starts to brown. Meanwhile make a duxelles. Chop the mushrooms in a food processor roughly. Cut 1 onion and grate 1 garlic clove, sauté in some olive oil for 5 minutes and add mushrooms. Bake for another 5 minutes and add 1 tablespoon lemon juice. Take stuffing mixture out of the oven and add the duxelles, thyme and add salt and pepper to taste. Add two eggs and combine well, use a potato masher. Cover both squash halves (on all sides) with the honey-stock mixture and fill both sides with half the stuffing. Cover both eggplant halves with the honey-stock mixture and add some stuffing. Put eggplant halves in both squash halves. Cut the zucchini in halve (probably only 1 – cut in two – will fit, unless you found a really small one) and cover with the honey-stock mixture, add the remaining stuffing and put the zucchini in the eggplant halve. Press both squash halves until both have a smooth top. Fit both halves back together, tie together with kitchen twine. Use some of the remaining honey-stock mixture to rub the ‘roulade’ and put it in aluminium foil. Put in the oven for approximately 2 hours – until soft. Let it rest for 20 minutes. Meanwhile combine remaining honey-stock with tablespoon honey and more honey, until it resembles a gravy texture. Add salt and pepper to taste. 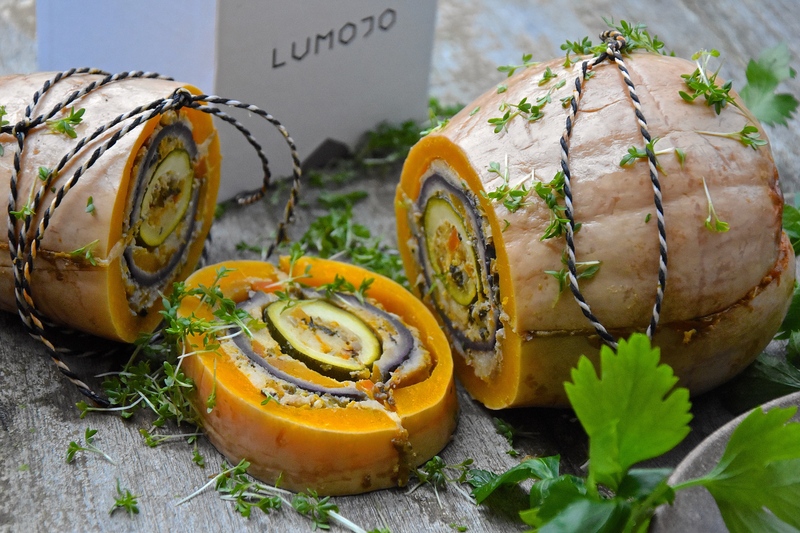 Slice your roulade in ± 1 ½ cm slices and serve with, mustard ‘gravy’, fresh herbs and cress.